Fiction – paperback; Vintage; 307 pages; 2008. Translated from the French by John Cullen. This novel, first published in 2005 under the title Les Sirenes de Baghdad in France, is yet another earnest and thought-provoking story by Yasmina Khadra, the non deplume of the Algerian Army officer Mohammed Moulessehoul. While The Attack was set in war-torn Israel and examined what it is that drives people to become suicide bombers, The Sirens of Baghdad is set in war-torn Iraq and looks at what spurs young men into becoming insurgents. The story is told through the eyes of an anonymous young man, a Bedouin, who lives in Kafr Karam, a village in the Iraqi desert, a “place so discreet that it often dissolves in mirages, only to emerge at sunset”. Determined to become more educated than his illiterate well-digger of a father, he attends the university in Baghdad a few months before the American invasion. But when the war begins, the university is vandalised and closed down, and he returns to Kafr Karam, “wild-eyed and distraught”. Back in his parent’s house, living on the roof in a remodelled laundry, he settles back into village life, feeling far removed from the troubles in the capital. But the war is soon brought home to him in a series of violent incidences involving American soldiers. These despicable acts — an interrogation and shooting at a US army checkpoint, the bombing of a wedding reception and a raid on the family home — turn the young man from a rather shy, sensitive creature into an angry youth desperate for retribution. And I happened to arrive in Baghdad the day a false alert caused an enormous crush on a bridge — you remember — and a thousand demonstrators got killed. When I saw that, cousin, while I saw all those bodies on the ground, when I saw those mountains of shoes at the site where the panic took place, those kids with blue faces and their eyes half closed — when I saw that whole mess, caused to Iraqis by Iraqis, I said to myself, right away, This is not my war. But what struck me most about this book — which is slightly laboured and over-worked in places, as if Khadra wanted to make sure we really understood certain points — is this: under a series of strict unwritten codes, revenge is vital to the Bedouins and insults can only ever be washed away in blood. I immediately thought of the protests over the Danish cartoons controversy and how violent it all became — and suddenly something “clicked” as if I’d been given a fleeting glimpse of a mindset I’d never quite understood before. 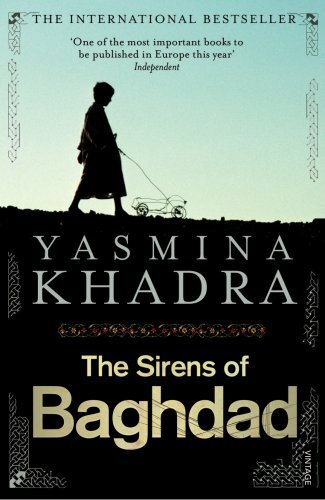 On the whole, though, The Sirens of Baghdad is a tough read, because it’s so damn depressing.The narrator doesn’t help things much because he’s effectively carrying the weight of the Islamic world on his shoulders and he is completely and utterly miserable for the entire story. Coupled with a cold, detached prose style, it doesn’t make for a cheery novel. But it’s a worthy, edifying read that leaves one deeply unsettled. I’ve really liked the book I’ve read by this author already.”The Swallows of Kabul” and “The Attack” were both very intriguing. I don’t get depressed by anything I read in novels so I’m okay about difficult subjects but I understand that a lot of people do. It’s nice to see an honest review. And I really like your sliding scale for rating a book. I must get one like it. Take care.